I shared a few pepper recipes using our garden peppers the other day, but I wanted to show some other options for using the peppers as well. A lot of hot peppers are stored or used once they are dried. 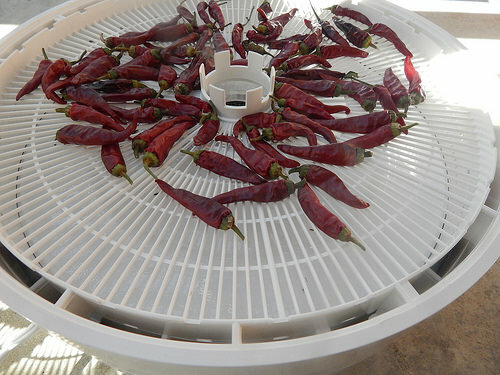 The most reliable way to dry peppers is using a dehydrator, although I’ve also had good luck (sometimes) using the oven or just letting peppers dry on the counter. The biggest issue with letting peppers dry on the counter is that if there is a chance the fruit have any fungal spores on them (or any blemishes), they can rot before they dry down sufficiently to store. 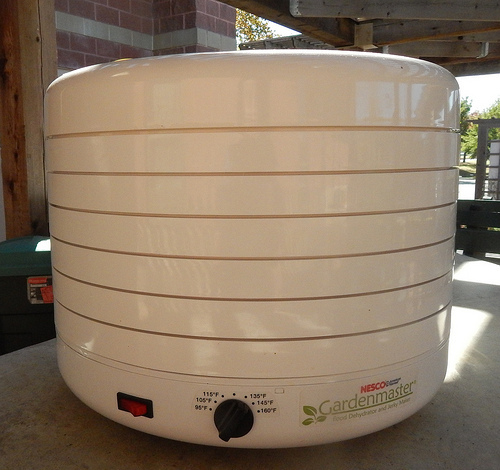 On the recommendation of Denise, our Foods & Nutrition Agent, I used the dehydrator outside and set at 135 degrees. It took about 8 hours to dry the smaller, hot peppers. It took about 16-20 hours to dry the larger, thicker-walled peppers, like the paprikas and Aleppos. The dehydrator had several racks, so I was able to segregate the different peppers onto different racks. I dried some of the cayenne peppers, lemon drop peppers, hot paprika peppers, and Aleppo peppers. I don’t have specific plans for any of these at the moment, other than possibly grinding them into either pepper flakes or powder. Well…the Lemon Drop peppers I have a hot sauce recipe to try. Sometime. I did try to spread out the peppers to start, but they ended up towards the center anyway. 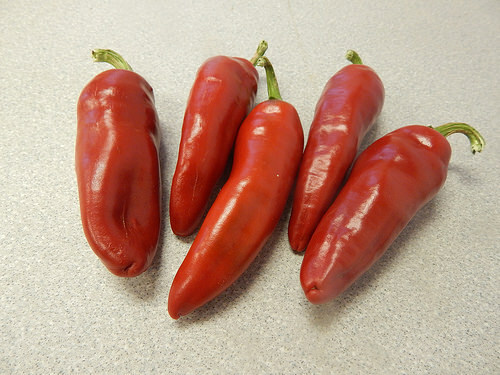 These are the cayenne peppers. You can still see a little of the purple coloration despite the fact that they wee mostly red. 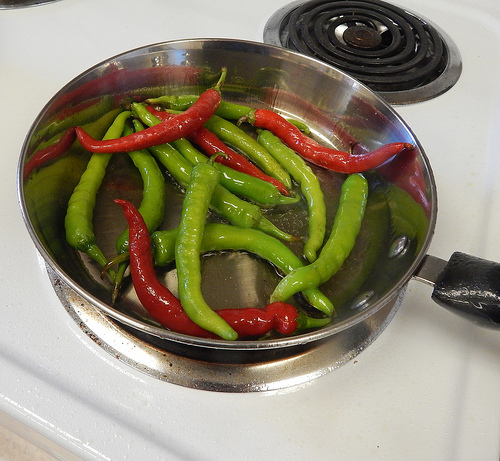 The Espelette (Basque region) and Fushimi (Japan) peppers, I tried with simple sautéing. The Espelette peppers probably should have been dried and ground instead…like a paprika pepper. Oh well. These are the Espelette peppers. I sautéed them in a little hot oil, then sprinkled them with salt. They were too spicy for me to enjoy in that way. Definitely would have been better as a spice. I followed with a pan of the Fushimi peppers. Hot pan, hot oil, fresh peppers. After cooking, I sprinkled them with salt and let them cool enough to eat. 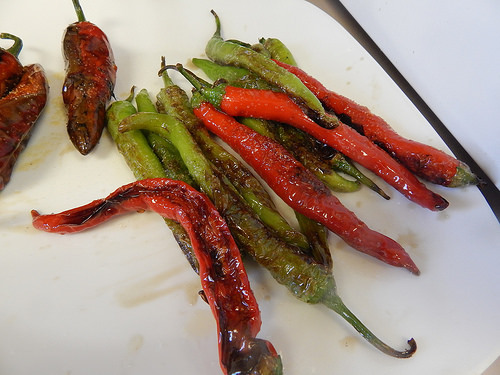 This is one of the traditional ways to prepare these Fushimi peppers and the similar Shishito peppers. YUM! I am definitely regretting the bags of these peppers that I harvested and intended to sauté earlier in the season, but never got around to. These peppers were not all that exciting otherwise. The walls are thin, the flavor was a little “green” and the seeds were too prevalent. But you sauté them in hot oil, sprinkle with salt, and they are transformed into a delicious appetizer. Posted on October 26, 2016, in Around the Garden, Plant & Garden Reviews and tagged hot peppers, peppers. Bookmark the permalink. 1 Comment. Do you take in plants like the zoo?